This is what one can afford when one can't afford to add the "du pape". I could have treated myself to the "du pape" but this is funnier so I bought it instead. Anyway, enough blogging it's time for a slurp. That's how the saying goes and I totally agree. An organised workspace is much more productive. It won't make one more creative but when that vital spark ignites the kindling and the logs are in place to build a roaring fire. One nice touch I added to my small ideas space is a subwoofer that I lined-out of my 10W practise amp. The small but perfectly EQ'd amplification is easily loud enough for my studio which is only a spare room and not the Albert Hall. The idea about this new space is simple. Get a few chords together using Chordbot and Applichord Mini while on the road. Sequence the result into my QY100 either manually or through MIDI (untested and experimental) and then record in my DAW or with the fourtrack. There is also the option of using my PSP which is easy to get MIDI files into. All in all it's a fine space and one that will get used considering I've only organised tools I already utilise. Now, where did I put that inspiration? What you can see above is a screen shot of my writing software. It has a web browser built in for research which is really useful. Because my novel is set in a real place I use Google maps street view to get my bearings and information I need for the story. While I was in the browser I got an error message asking if I still wanted to run scripts on the page, I clicked yes then went back to writing. The next time I went back to the browser Google street view seemed to be in 3D. I went downstairs and grabbed the handful of coloured chocolate wrappers I'd saved from xmas. They're blue, red and green. 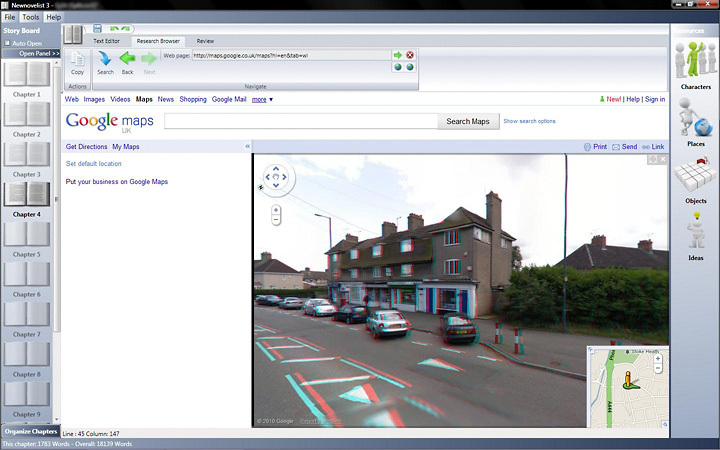 Because the 3D shift was in red/blue I held a couple of wrappers up to my eyes and there was street view in 3D. Click on the picture to enlarge it and try for yourself. I haven't heard any rumours of street view in 3D so is this a one off or are we all going to be treated to a 3D option at some point in the future? I really enjoy Sunday afternoons. There isn't much to do and I can usually find something to watch on TV. Its about the only day I do watch TV and usually I watch hours of Antique Roadshows (sic). Sunday is also the day I get to sit down and enjoy a bottle of wine. Increasingly with my evenings taken up with either writing or DJing wine is off the menu. I also get round to eating oven chips and baked beans. It's a comfort food and drink day. It's been a while since I've used MIDI files. Until recently I hadn't given them any thought at all. Then Chordbot came along and changed everything. It's a fantastic chord sequencing app on my iPhone. I've blogged about it here before. It produces MIDI files which from the last update you can email to yourself. I mailed one last night and dropped it into FL Studio and it worked perfectly. I thought tonight however that I might try something a little different. I mailed a new file to myself and then opened the browser on my PSP. From there I imported the file to my Beaterator folder and as you can see from the picture above it worked. The keyboard in Beaterator is only 5 octaves and so it missed most of the bass notes out but as the bass notes are the chord root I'll have no problem adding some more. Besides, I am going to mess with the bassline anyway so it works out fine. My next trick will be to get a Chordbot MIDI file into my RM1x. That'll probably be a bit trickier but it's worth a go. Here's to the new music writing revolution.